Grilling without meat is a little bit different and, if you're used to steak and burgers, then you might need to get a little creative when it comes to what, and how, to barbecue as a vegetarian or a vegan, or as someone hosting vegetarians or vegans at their grill party. Want to make sure your vegetarian barbecue goes off without a hitch? Here are some quick tips and "how-tos" for vegetarian and vegan barbecuing! Just need some recipes? Scroll through dozens of vegetarian and vegan barbecue recipes from simple sweet corn to a fancy tequila-flavored mushroom recipe - you'll be sure to find something to try! When cooking meat along with vegetarian items, you should know that many vegetarians would prefer not to have any meat remnants touch their food. For this reason, it's a good idea to thoroughly clean and scrape your grill after cooking any meat and before placing vegetarian items on the grill. Another alternative is to designate a separate section of the grill for vegetarian items and make sure that this section is well-cleaned before firing up the grill. If possible, many vegetarians would prefer to have their food cooked on a separate grill. Check in with your vegetarian guests before the day of your big barbecue and see which option they would prefer. See also: Vegetarians coming? Here's what to grill. Vegetarian Grilling Tip #2: You need to prepare your grill first. First, when shopping for food for your big barbecue, read the cooking instructions on the package label! Some pre-made items, such as some veggie dog brands, simply are not meant to be grilled and the cooking instructions will say so. If you try it, you'll end up with a sticky mess rather than a picture-perfect meal! Second, don't expect your mock meats to behave the same way on the grill as their meat counterparts. Veggie burgers will taste great, but they just don't have the same natural juices and fat that a beef burger has. While this is great for your cholesterol and your waistline, you'll want to prepare your grill to prevent veggie burgers and mock meats from sticking to the grill. Clean your grill as you normally would, being sure to scrape off any bits and pieces. Once your grill is clean and cooled, take a paper towel dipped in oil and rub it thoroughly over the grates. Alternatively, spray your grill with a non-stick cooking spray. Now you're ready to grill! Vegetarian Grilling Tip #3: You can grill cheese! Grilled halloumi cheese photo by flickr user Mags L.
You know how delicious grilled cheese sandwiches are and how we all love them? Part of the reason is because they are the perfect combination of comforting carbs, delicious fat melted on to those carbs, and the texture of the oozing gooey melty cheese. This vegetarian grilling tip is about to change your life. Or at least expand your palette. Grilling cheese on the barbecue is pretty much just as amazing as a grilled cheese sandwich. And better in a way. But don't just walk outside and dump a chunk of cheddar on the grill, you need a grillable cheese. There are a few kinds which will work, and some stores even sell cheeses clearly labeled "grillable cheese". These are usually similar to a halloumi cheese and sometimes called "halloumi-style" cheeses. Paneer, which is a firm fresh Indian cheese, can also be grilled. See also: What is halloumi cheese? Vegetarian Grilling Tip #4: Quick and easy things to toss on the grill. Grilled pineapple photo by Getty Images / Luzia Ellbert. Yum! Grilling Tip #5: Before you grill your tofu, read this. If you'll be grilling up some tofu, make sure it is extra-firm and well pressed . Like all vegetarian meat substitutes, tofu is much lower in fat than meat, so use more oil to grease up your grill to make up for it. Nobody likes sticky tofu and nobody likes cleaning a grill with tofu char stuck to it! 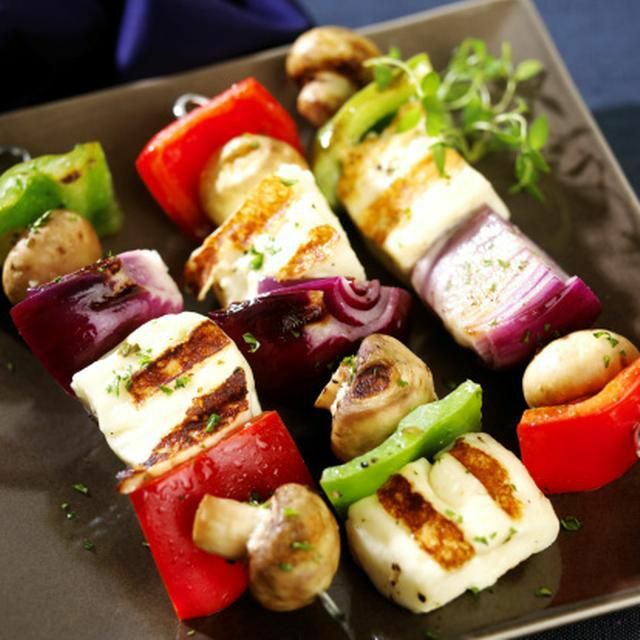 Tofu, along with smaller veggies such as brussels sprouts and mushrooms, works well on bamboo skewers -- just be sure to turn the skewers frequently so all sides are evenly cooked. You may also want to learn some more about how to grill tofu. Vegetarian Grilling Tip #6: You don't have to cook EVERYTHING on the grill. Just because it's a barbecue, doesn't mean all the food has to be on the grill! Add grilled veggies to a green salad, couscous or quinoa, make a grilled vegetable sandwich, or grill some pineapple for a pineapple and banana ice cream split! Another idea is to toss your grilled veggies with pre-cooked pasta for a main dish or add to a pasta salad. Or, serve your grilled veggies inside of scooped out French bread or rolls with some soy or dairy cheese for a grilled veggie sandwich, maybe with a little pesto or vegan mayonnaise. Did You Know It Takes Three Years to Make Tabasco Hot Sauce? Do You Have Everything Needed for a BBQ Party?